The Aztec Conure or Jamaican Conure or Olive-throated Conure (Aratinga nana astec) is a Central American species that is endemic to the Caribbean slope from Veracruz, Mexico, along Caribbean slopes, Costa Rica, south to Almirante Bay, extreme western Panama; and Honduras. This species is most abundant in Yucatan, Mexico, and specifically Western Yucatan where they form large, noisy flocks. The disjunct distribution range compared with the other members of the Aratinga nana family largely accounts for frequent treatment of race astec as distinct species. This species is endangered in its range due to habitat destruction and capturing for the pet trade (CITES II ). 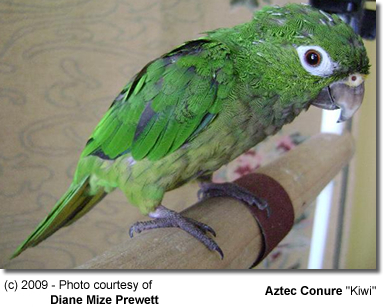 Aztec Conures are not readily available in areas outside their natural range. The main reason is likely to be that they are difficult to breed. In their natural habitat they nest in rock crevices and many breeders still haven't been able to provide an optimal breeding environment for these conures. Pet owners report that their Aztec Conures make excellent pets. They are not as noisy as the other aratinga conure species (which doesn't mean that those sensitive to noise could tolerate their natural voice). They still have shrill calls that they voice when alarmed, in the morning and late afternoons, or when they get excited. Well-socialized Aztec Conures are friendly and playful. They have a strong urge to chew - so plenty of natural branches (preferably with leaves still on) should be provided for beak conditioning as well as exercise and entertainment. Some learn to talk. The Aztec Conure averages 9.5 inches or 24 cm in length. The tail alone is about 3.6 to 4.6 inches or 92 - 118 mm. 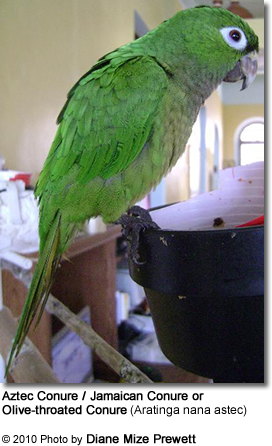 The upper plumage of this conure is green, which extends to the cheeks and ear-coverts. The quills are blue, tipped with black, and green at the base of the outer webs. A narrow orange-yellow band can be seen between the nostrils. The throat and upper breast are olive-green, with shaft stripes of a darker shade of the same color. The lower breast and abdomen are olive-yellow. The thighs, flanks and under tail-coverts are green. The tail is green, tipped with blue above and golden-olive below. Young birds have darker irides (= plural of iris). 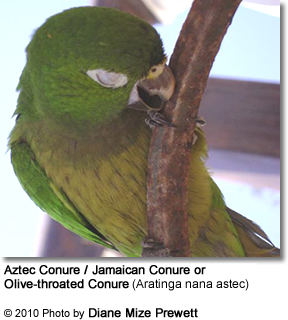 The Aztec Conure shares many of the physical features of the nominate species -- the Jamaican Conure. 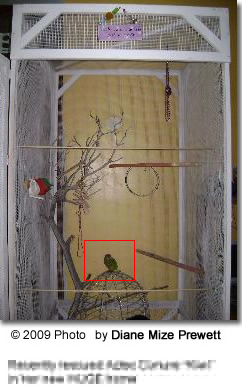 However, the Aztec Conure is physically smaller and has a smaller bill. The green and olive plumage is much more yellowish. The abdomen is olive-yellow. 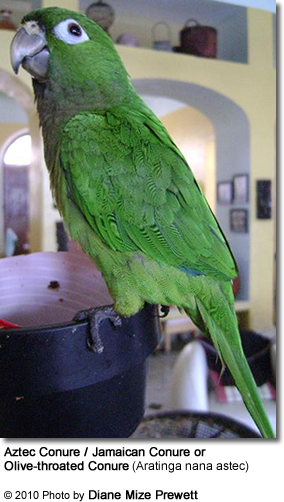 Also the native range of the Jamaican Conure is restricted to Jamaica in the West Indies. The Aztec Conure looks similar to the Brown-throated Conure -- however, it can easily be distinguished by the yellow ring around the eyes of the Brown-throated Conure. The Aztec Conure could also be confused with the Cactus Conure. The throat of the Cactus Conure has a paler and softer shade and the underparts are pale yellow.